NUANCE: How can you currently describe the state of connectivity in research and education institutions in Tanzania? DM: The connectivity in research and education institutions in Tanzania has grown significantly due to the commissioning of the National ICT backbone. The government has played a huge role through its initiative to build research and education MPLS network. Number of institutions connected by TERNET has increased from 10 to 30 and internet bandwidth utilisation has also grown from 155Mbps to 450Mbps. NUANCE: As TERNET, what are some of the successes you have achieved since becoming operational? DM: The connection of 4 STM1 has given to TERNET an opportunity to extend its services to its members. The initial STM1 was already exhausted. Total capacity has grown to 1Gbps. As stated the number of institutions connected have grown from 10 to 30, we are building capacity of member institutions, we have trained ICT technical staff of more than 8 institutions and have improved institutions campus network through Direct Engineering Assistant (DEA). We have also been building capacity of graduates who become Interns and undergo through our programs including training for 6 up to 12 months. NUANCE: As CTO, what do you think are some of the services that TERNET needs to be offering to its member institutions that are currently not being offered? DM: There are many services we can offer our member institutions that we are currently not offering. These services include eduroam, mail hosting and filtering, web hosting, Video conferencing, VPN services, e-Library and repository and e-learning platform. NUANCE: How has the UbuntuNet Alliance been of benefit to TERNET? DM: UbuntuNet Alliance has been beneficial in TERNET visibility, things like the featured articles they write about us and information they present on their web pages. UbuntuNet Alliance is also a platform for networking and sharing experience among members; therefore, we have been learning from other members. We have also benefited from capacity building to improve our technical staff. Exposure visits and networking with other NRENs and RENs, sponsor on attending CEOs and CTOs meeting and training on running NRENs have been very valuable. NUANCE: As CTO of TERNET, what is your vision of the NREN? DM: I am focusing on enhancing human resources, improving the governance and management, also helping member institutions with their infrastructure and services, local content for members and improving finance sustainability. Find strategic areas that will make partnership with the government be improved and stable. NUANCE: What are the main challenges facing your operations as TERNET? DM: Main challenges include ownership of infrastructure. The infrastructure does not belong to TERNET. 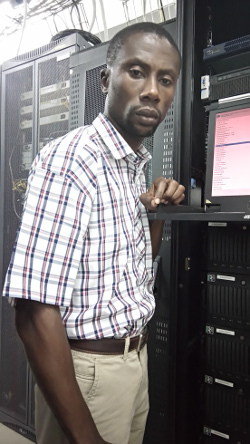 The National ICT backbone is a project which targeted some institutions and so it became difficult for other institutions not in the project to connect to our network operations center (NOC). The other challenge is the instability of our NOC due to absence of powerful power backup and upstream redundancy link in case of failure.